Our waiter is all business and intuition. “You’re going to Druid aren’t you? Don’t worry we’ll get you out of here on time.” Galway is proud of Druid and rightly-so. Even the waiters conspire to assemble the audiences in a timely fashion. This evening was the opening performance of an epic run for Druid Theatre Company. 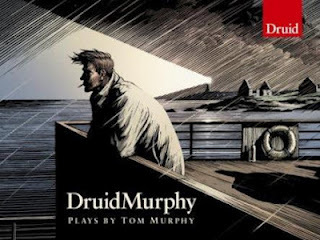 ‘DruidMurphy’ presents a cycle of three of Tom Murphy’s most acclaimed plays in a tour that will take them to New York, Washington DC and Tuam, to name but a few. Tonight, I was lucky enough to be in the Town Hall Theatre (on time) to see ‘Conversations on a Homecoming’ for the second time in my life. ‘Conversations’ holds a special place in my heart and memory. When I met my wife-to-be in London, she was newly arrived there from her hometown of Galway and, before leaving, she had seen Druid do ‘Conversations’ in Flood Street. She told me all about it and, when it finally arrived at the Donmar Warehouse in London, she brought me to see it. Then she bought me a linen-bound edition of the text which I have here on my desk now. I had to explain that. I had to explain that I can’t really tell you about the performance I saw tonight as an isolated event. I can only tell you about the amalgam of the play I saw over twenty-five years ago and the one I saw this evening. For me, ‘Conversations’ is about many things. It’s about going-away and coming-back, failure and embitterment, friendship and enmity, small town morals and big city vacuums. It is, above all else, an utterly ‘Irish’ play. More specifically, it is a ‘Galway’ play and the subtlety of the writing can make us believe that we actually know real people who are the actual doubles of the characters in this play. I thought the original cast were Definitive and did not see how this (mostly) new cast could carry this play off again for the old-timers like me. Indeed, for the first five minutes-or so, it was as if the Theatrical Ghosts of McGinley and Stafford hung over the characters as they assembled in the bar. Not for long though. Rory Nolan as Junior was the first to win me over. God, he was so like Trish’s brother Enda, it was unbelievable. (He wasn’t, really, I suppose, but Enda is Real Galway and so was Junior.. Real Galway). Aaron Monaghan as Liam was simply outstanding. His descent from marginalised compadre towards belligerent drunk was recognisable to anyone who has ever spent time in an Irish bar. Like a Crumpled Pacino or a Displaced Bada-Bing Back Room Sidekick, he radiated shady dealings and dubious integrity. He was a black hole for respect and affection. A wonderful performance. Garrett Lombard as Tom had the harder sell. Tom is not the most likeable character but he is, perhaps, the one we most identify with. He wraps himself in rhetoric and cynicism but the overriding fact of his existence is that he has failed and this failure has crept up and blindsided him and left him solid and lost in the corner with his borrowed newspaper. Marty Rea is Michael, the returned friend. He gets to deliver the killer line of the play, which I wouldn’t dare throw away here. As a moment, it was extremely effective and Tom’s reaction to it was equally so. The wonderful presence of Marie Mullen onstage gives this new production this deeper context of time passing. Marie was here twenty five years ago too, being just a brilliant and funny as ‘Peggy’ as Eileen Walshe is now. Now, however Marie plays this aged ‘Missus’ and the sight of her (playing older than she is) in Pat Leavy’s role is nonetheless our own personal sucker-punch of nostalgia and aging. Garry Hynes directs the play with precision. The sequential placing of pint glasses on tables seem almost musical at times and the choreography of chairs and cigarettes and money and drink is an integral part of the whole. ‘Conversations’ puts us in a place where a licence is granted not just to serve alcohol but to argue and berate and fight and curse and laugh and hate and love. A place where you can finally admit that everything is ruined and without joy only then to wipe it all on the doormat on the way out the door to stumble home and perhaps come back and do it all again another evening. ‘Conversations’ isn’t always easy. It’s preachy at times because the characters in it tend towards the preachy. It’s rather bleak in its outlook and there is real sadness in so many of the characters therein. But there is recognisable truth in it and that is always ultimately uplifting. Congratulations to Druid for bringing back ‘Conversations on a Homecoming’ with even more weight and depth and truth than it had twenty-five years ago.